The Cannibal. Conjuring images of human steaks and a high risk of catching kuru, I love this beer-and-meat-centric pub, sister restaurant to the late lamented (by me anyway) Resto, and the second best food thing about working in Murray Hill (proximity to Kalustyan's is number one). I was there a couple of months ago with some work friends and we made a plan to come back for the half pig's head. 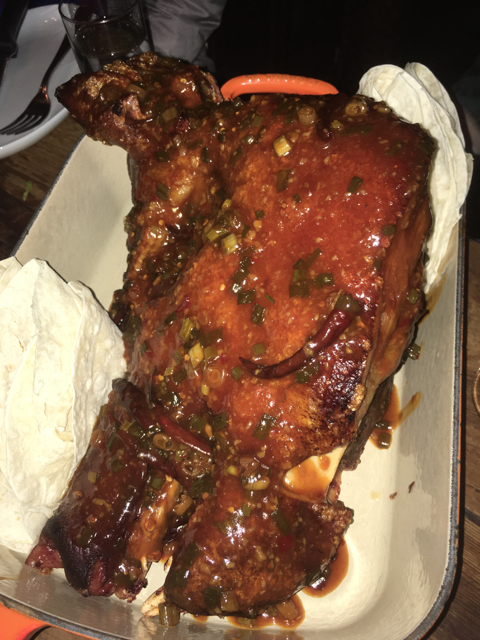 Because when you see half a pig's head on a menu, I think you're sort of duty-bound to order it. It took a while to schedule, but today was the day for it. And it almost didn't happen! In the interim the Cannibal took it off the lunch menu; normally it's only available as a dinner item now. Good to know. Fortunately, the server helping us out asked in the back and they had one head (like, two half-heads) that they could make for lunch, if we were willing to wait. And we were willing to wait. We ordered some sausage and Brussels sprouts and other stuff, and some beer. And lo and behold, in due course this beauty came and joined us at the table. The Cannibal does their half pig's head General Tso's style -- lots of peppers and green onion and a sweet-and-spicy sauce with anise and Szechuan peppercorns and whatnot. And served with some greens and thin pancakes for wrapping in. Wow. I've had whole pigs a couple of times, but never dug into a head (or half a head)--we focused mainly on the rest of the animal. And those were suckling pigs, not a grownup. 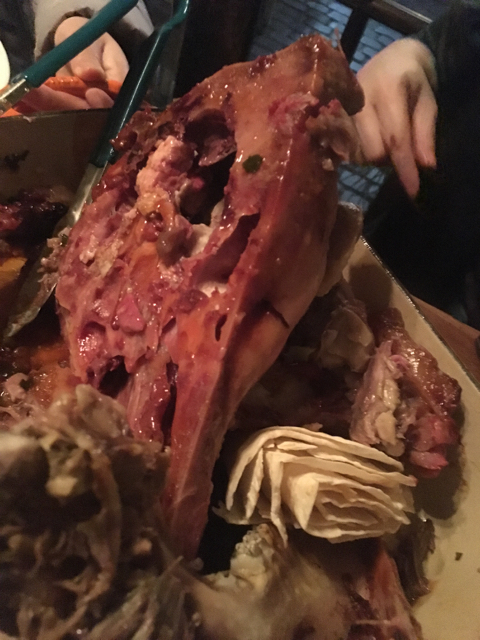 Half a pig's head is daunting. 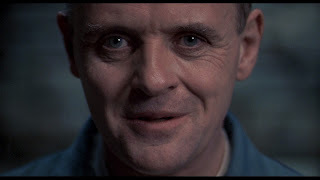 And carving something's face up to eat it can't help but evoke, let's call them "Lecterian" thoughts. Especially given the name of the establishment. Once we got going though, wow. My second reaction was, it was surprisingly fatty. I suppose I shouldn't be surprised, jowls and all. But lots of fat. Almost to the point where I'd say belly has nothing on face. It was interesting from a purely anatomical perspective exploring the head to find the meaty bits (the underside, like I guess the bottom of the jaw muscles?, was particularly good. And cheeks of course.). I didn't really love the ear. I have had stellar pigs' ears before, and was looking forward to this one. But it was a little too chewy for my taste -- I like them when they are super super crisp. Maybe a pig versus piglet, size thing? The skin was phenomenal, though. Despite the glaze, it was crisp and flavorful, absolutely perfect. Lastly I'd say that if you ever want to follow in my dining footsteps, bring a group. We were four and ordered several other things, and the head was plenty for us. A smaller group would definitely have had leftovers. And as with other major carnivorous experiences, I found that all I really want for the next 24 hours or so is, like, a salad or maybe a little sushi. Balance must be restored! My sincere thanks to M., E., and L., for their dining adventuresomeness. Looking forward to eating with you again!